Heron was in pretty deep shade and this is a huge crop. Please view high res. 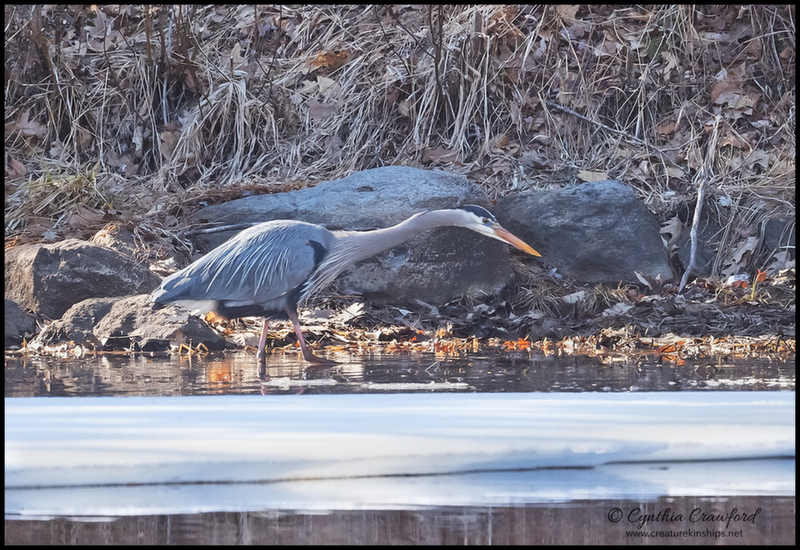 Great Blue has returned to nearby icy pond. It was very intent on grabbing a crayfish, which it caught, and had a lot of trouble getting i tdown the gullet. Delighted to see it back here. Nice hunting pose captured, Cindy. Excellent hunting pose, Cindy, in a nice natural setting with the ice and background habitat. a typical hunting position for this heron, great angle of view CYNTHIA. Nice pose and nice low angle... I think a bit more saturation would look good. Lovely habitat image, love the hunting pose. Classic stalking pose. Nice low angle shot Cindy! Looks good for heavy crop. Excellent detail for a 'huge crop' as you say. Nice hunting pose in lovely natural habitat, giving so much to see and enjoy here, Cindy. Well done!